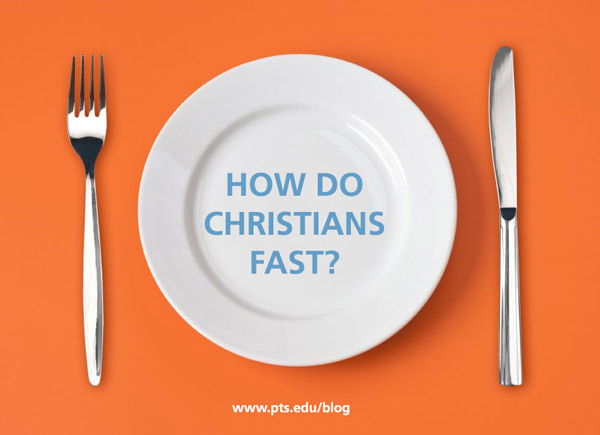 Yesterday we answered the question “Why do Christians fast?” Today we’ll take a closer look at how Christians fast. Though there was no single method St. John Cassian prescribed, he did offer “a single goal: avoid overeating and the filling of our bellies.” While going long periods of time without food is a common form of fasting in Scripture, for many of us it can backfire and lead to binge eating when breaking a fast. In contrast, refusing to get seconds or putting down your fork before you’re full can be simple but powerful way to fast, and avoids the dangers of either irritability or binge eating. In Celtic monasticism, people like St. Aidan often waited until after 3:00 p.m. to eat, but then ate whatever was available in moderation. They didn’t want to eat during the hours when Christ was on the cross. How might the timing of your meals create a greater awareness for you of the events of Christ’s life? Our Eastern Christian sisters and brothers abstain from meat and dairy products on most Wednesdays and Fridays during the year, and do the same throughout the entire season of Lent. Wednesdays are traditionally fasting days because they are the day on which Judas agreed to betray Jesus. Fridays are fasting days because of the crucifixion. The restricted diet helps one grow in consciousness and discipline, but doesn’t deplete one’s energy as much as a total fast. St. Ignatius of Loyola wrote that “While one is eating, it is good to imagine Christ our Lord eating in company with his apostles, and to observe how he eats, how he drinks, how he looks about, and how he converses, and then to try to imitate him. In this way, one’s mind will be occupied chiefly with the consideration of Our Lord and less with the sustenance of the body.” Similarly, I know a pastor who has a large replica of Rublev’s famous Trinity Icon in his dining room. When he practices his morning devotions, he imagines sitting at the table with the Trinity. How might we eat differently if we were sitting at the table with Jesus? Regardless of how we fast, we do it as a discipline to bring us closer to God. The Rev. Christopher Brown moved to Pittsburgh from Colorado to pursue a master of divinity (MDiv) degree at Pittsburgh Theological Seminary. He currently serves as the coordinator of the Church Planting Initiative at the Seminary along with pursuing his master’s in sacred theology. Chris is the organizing co-pastor of The Upper Room Presbyterian Church, a church plant of the PC (U.S.A.) in Pittsburgh’s Squirrel Hill neighborhood. Chris regularly blogs at https://christopherbrown.wordpress.com and tweets at @brwnchrstpher. St. John Cassian. p. 73. « Why do Christians fast?